Cheim & Read is pleased to announce an exhibition of recent paintings, sculptures and works on paper by Donald Baechler. Baechler's previous solo show with the gallery was in 2006. Donald Baechler was born in Hartford, Connecticut in 1956 and currently lives and works in New York City. His work has been internationally exhibited and collected; his most recent museum show, titled XL + XS was at the Museo Arte Contemporanea Isernia, Italy, in the fall and winter of 2009. Other recent international exhibitions include additional shows in Italy (in Trento, Vermiglio and Torino), as well as in Spain, Sweden and Austria. Cheim & Read has represented Baechler since 1999. One of the more admired painters of his generation, Baechler's successful career is testament to his focus and originality. His unique way of developing imagery has provided a cohesive body of work, and has allowed him to accommodate newly evolving compositions and ideas. In his work, Baechler examines the construction of artistic representation, but the seriousness of this exploration is tempered by undertones of humor and wit. Thickly outlined in dense black, the elements of his paintings (flowers, globes, skulls, beach balls) have a distinctive sensibility, reminiscent of children's drawings, old tattoos, folk art signage and graffiti. Though the uniqueness of his style is directly linked to the graphic iconography of his subjects, Baechler seeks to reveal universality in the visual ephemera of our common culture. Baechler's working process is informed by a constant gathering, collecting, sorting and assembling, the result of which is then recreated, interpreted and incorporated. While his methodology is most evident in collages and works on paper, which provides him with a template for working out ideas, it is also frequently visible in the backgrounds of his paintings. Layered grounds are assembled from an accumulation of smaller images, sometimes partially painted over, producing what Baechler refers to as a "fractured surface" of physical and visual complexity. The subject, painted later, inevitably records the bumpy topography of the accumulation below. Furthering this concept of layering, Baechler repeats his images in several mediums, thus creating a loose series: a multi-referential catalogue of pictures, all slightly different, of the same thing. In his new exhibition at Cheim & Read, Baechler continues to employ motifs that have become trademark to his oeuvre, but further explores the figure–ground relationship in his compositions. Several paintings are made directly on paint-splattered canvas drop cloths from his studio floor. The spatial intricacies provided by the drips and washy spills in these "accidental" backgrounds contrast the flatness of Baechler's foreground imagery, and seem to playfully reference Abstract Expressionism. 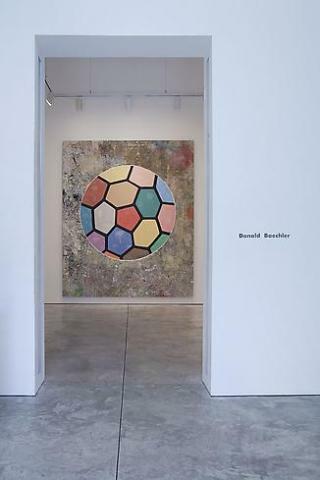 One might also see constellations or psychedelic universes, a possible reading enforced by Baechler's collage of planets in the background of Red Rose, 2010, or by Globe, 2009, in which a flattened earth is centered on a multi-colored milky way. Flowers dominate the show: roses of different colors appear in several separate, large-scale paintings, and big bronze bouquets, painted white, belie their rigid material. In Yellow Rose, 2010, Baechler positions his subject on a grid of flowers, punctuated by additional, brightly colored buds floating near by. Especially when exhibited alongside his paintings of skulls, it is tempting to read the flower works as a sort of contemporary vanitas, a reference to art historical still life painting, domesticity and mortality. Or, perhaps, they are simply welcome harbingers of spring.